Name Origin: Alice and Eva were daughters of Resurreection Bay homesteaders, Frank and Mary Lowell. Historical Context: This episode takes a look at the Lowell homestead, the founding of Seward, and the explosive growth of the town site. Name Origin: Tern Lake has not always been known as "Tern Lake". It used to be called "Mud Lake". The name was changed to be more appeasing to tourists. Historical Context: This episode starts with Willard Dunham talking about the Malcolm Bus Lines of the 1940's. 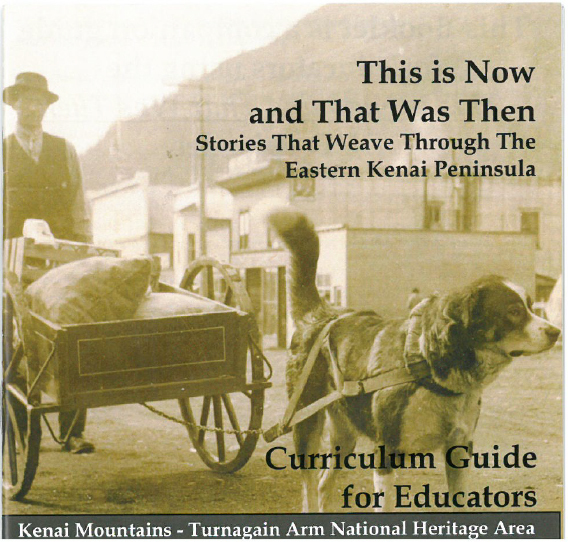 From these stories the program segues into the construction of the road system of the Kenai Peninsula. Name Origin: Resurrection Bay comes from Russian, Voskresenskaia Gaven (Sunday Bay), since it is believed Baranov came in the Bay on a Sunday...perhaps on Easter Sunday. Historical Context: This episode explores the Russian territorial days. The program focuses upon the Russian fort and the building of the ship, Phoenix. Name Origin: The lake and river are derivatibes from the Kenaitze Indians - the regional group of the Dena'ina. Historical Context: This episode acknowledges that the names that we use for landmarks are not the original names the Indigeneous people had their own names for these features. The program provides examples of Dena'ina names for features to present a different perspective and relationship with the land. Name Origin: Originally Mount Marathon had many informal names such as "Lowell Mountain". The mountain aquired its present name after the race that is held every 4th of July. Name Origin: Canyon Creek got its name from the canyon it flows from. The Forks is where Canyon Creek flows into Six Mile. Six Mile was that distance from the thriving gold town of Sunrise. Historical Context: The Forks was ground zero for much of the gold mining in this portion of the Kenai Peninsula. This episode discusses the geology of the Kenai Peninsula, the connection with gold deposits, and the methods used to extract the mineral. Name Origin: Exit Glacier aquired its present name when the 1968 Hoeman expedition used the glacier to exit off the Hardig Ice field. Name Origin: Local lore tells the story of the town getting its name sake from a young man, Percy Hope, who arrived in town. However, it more than likely got the name from the optimistic miners hoping to strike it rich. Historical Context: What was it like to be raised in a gold camp in the late 1800's? This is the question that Matt poises in this episode. This episode focuses upon Bobby Mathison who arrived in Hope as a young lad during the peak of the gold rush then continued to live his life in the area long after the gold played out. Name Origin: Victor Creek was named for a miner who established a homestead on the banks of this stream. Name Origin: The source of the name "Turnagain Arm" commemorates the Northern exploration of Captain James Cook. Historical Context: This episode explores the idea, or rather the hope, of the existence of a short cut (a Northwest Passage) between Europe and the Pacific Ocean. Name Origin: Local lore says that Moose Pass got its name from a cantankerous moose that wouldn't let the mail team go through. Estes Grocery comes from the patriarch of Moose Pass: Ed Estes. Name Origin: The town site acquired its name from nearby Portage Glacier which provided a relatively safe and easy route for indigenous people and miners to travel between Prince William Sound and the Kenai Peninsula. Historical Context: The town of Portage was abandoned following the 1964 earthquake. This episode takes a look at how the earthquake effected the Kenai Peninsula through the eyes of then 11 year old Tom Gillespie.